T29081 - Beautiful,Stylized Multi-level 2.5-D HDU sign for the "Deer Run" Bed & Breakfast (B& B). Above is shown a beautiful and colorful stylized multi-level 2.5-D HDU sign for the "Deer Run" Bed & Breakfast (B& B). 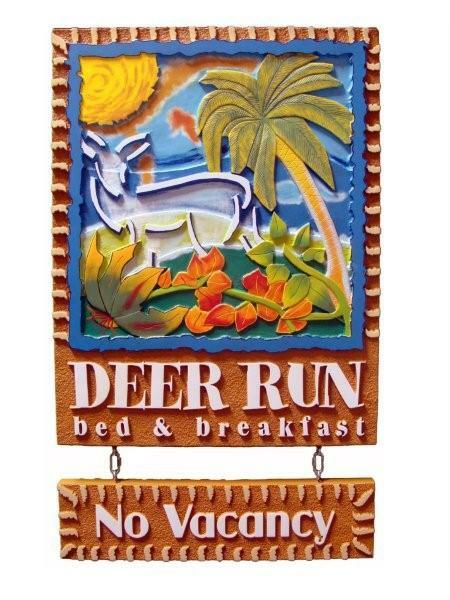 This colorful and unique multi-color sign features raised rustic text , a border, and a multi-level tropical scene with a deer. It has has a tan sandstone texture sandblasted background . The sign is hand-painted and then clear-coated twice. This sign can be easily mounted on an outside wall or placed between two posts. It has a hanging rider sign that can easily be changed from "No Vacancy" to "Vacancy" by unhooking the sign and flipping it over. This sign is an excellent example of how we can turn a painting into a beautiful practical dimensional sign.